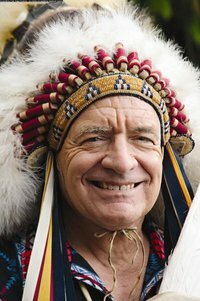 …During the past 43 years, he has worked with Indigenous peoples in North, Central and South America, Micronesia, South East Asia, India, Hawaii and Africa. He served 16 years as Associate Professor and Founder and Coordinator of the Four Worlds International Institute at the University of Lethbridge, Alberta, Canada. Four Worlds became an independent Institute in 1995. As well, Phil is Chairman of Four Directions International, an Aboriginal company, which was incorporated in 1996 as Four Worlds’ Economic Development Arm. This entry was posted in Make No Bones Shows and tagged Chief Phil Lane Jr., Connecting with Spirit, Honoring, KAOS 89.3 FM, Make No Bones About It, Raven Redbone, Thanks. Bookmark the permalink. Thank you for the notice Raven…he is a remarkable man and it is truly an honor.